Introducing the Quickie QM-710. This incredible chair is available in three different styles, is a reliable high-performing, stylish power base that meets a broad range of client needs. 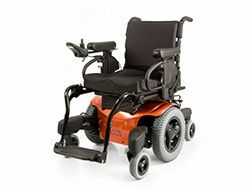 Features like SpiderTrac® Suspension, an intuitive mid-wheel drive base, and PG Drives electronics provide superior ride comfort over any terrain. The Quickie QM-710 is available with a full range of sophisticated seating systems including the ASAP® II traditional rehab seat frame specifically designed for complex clinical power seating applications. Contact Access Rehab today to arrange a demonstration and trial on this remarkable chair.